The goal of this makeover was to demonstrate the capability of enhancing the presentation of instructional content (MS Word Documents) and supporting materials (MS PowerPoint Presentations). These materials were part of the first module of a 5-credit course for a Healthcare Database Management and Design Certificate Program. The materials were originally submitted as part of a 25MB zipped filed of Word Documents and PowerPoint Presentations. These materials were submitted by Pierce College of the CHEO Grant Project. The iBook format provides offline accessibility to the material. This iBook platform also provides a format change that may appeal visually more than Word or PPT. The Apple products used in this makeover were used at no extra charge, while you pay for the MS Office applications. The iTunes store handles distribution and offers the option of payment (should one wish to commercialize a derivative). 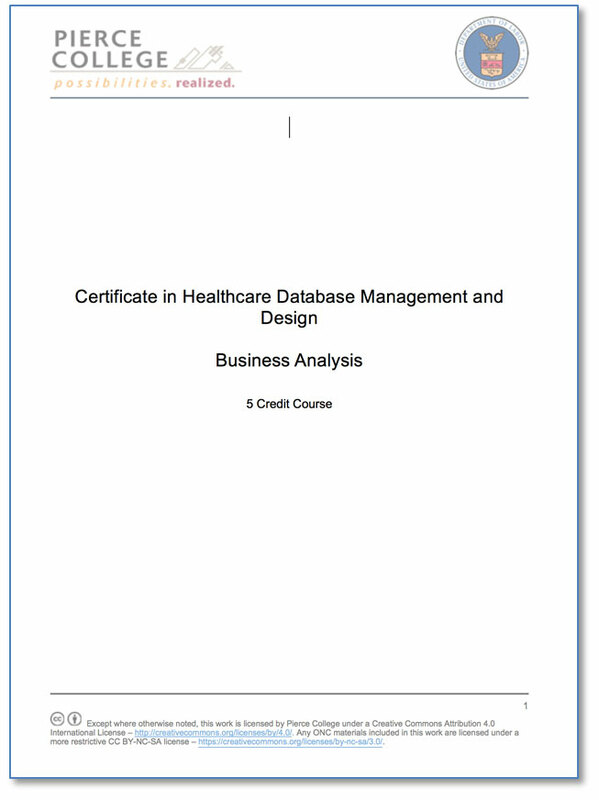 Description: The Certificate in Healthcare Database Management and Design (HDMD) is designed for students interested in a non-clinical care IT profession in the health care industry merging both the healthcare background with IT enterprise database and business analysis skills. 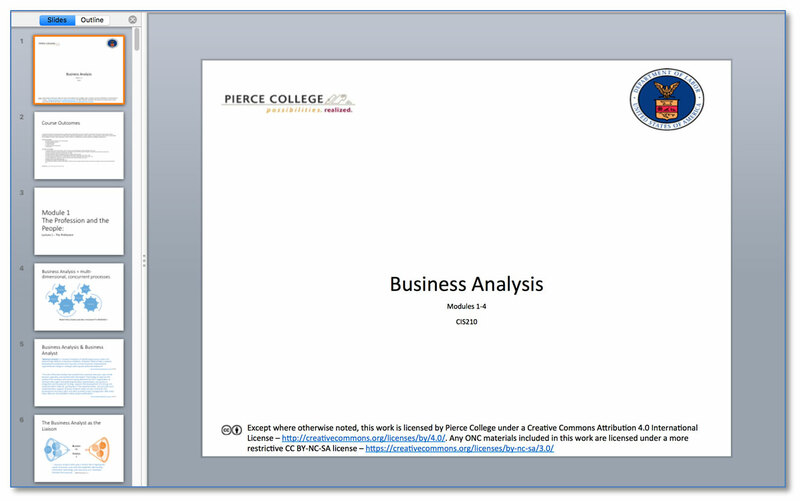 This makeover example was limited to module 1 of a 4-module business analysis course. The original text was extracted from the zip file as a MS Word Document. The text that was used is highlighted (see picture below). The three lecture presentations for this makeover were taken from slides 1-36 of the original 100 slide PowerPoint presentation for Modules 1-4. The content of the files were organized into a single iBook format. The original text from the MS Word Document was formatted using the iBook Authoring Tool (a free application on Mac operating systems). The lecture presentations were made over with Keynote for the Mac (a free application on Mac operating systems) to enhance them with animations and transitions and to make them interactive. An interactive review of the three lectures was created using a review widget in iBook Author. 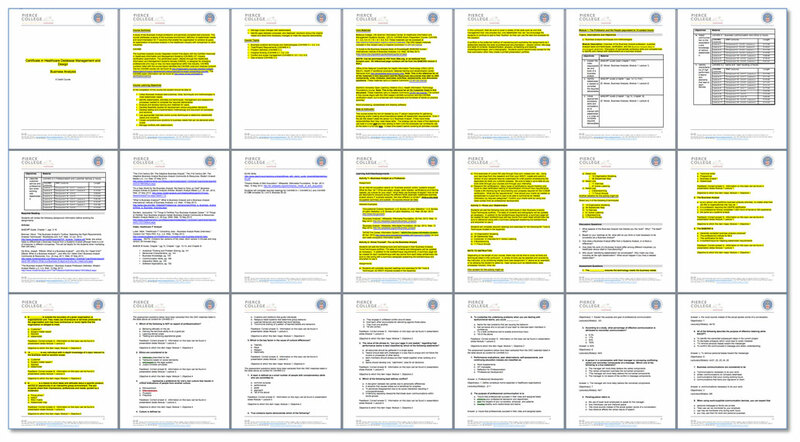 The review was based on an assessment of the lectures taken from the MS Word Document.